The cyclist revealed that his lawyers “didn’t see it as an option to appeal”. The Spaniard received the ban in February. ALBERTO CONTADOR HAS opted not to appeal against the two-year ban handed to him for failing a doping test during the 2010 Tour de France. The Spaniard was given the retroactive ban by the Court of Arbitration for Sport (CAS) in February this year, but has always pleaded his innocence having blamed testing positive to clenbuterol on eating contaminated meat. 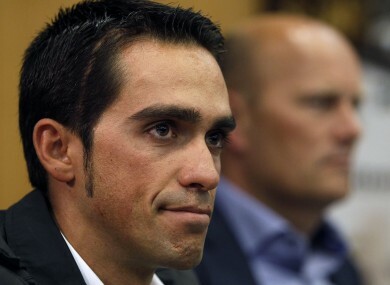 Contador, 29, said an appeal to the Swiss Federal Court was out of the question. “Last Friday, I spoke to my lawyers and they told me they didn’t see it as an option to appeal to the Swiss Federal Court because it could be a waste of time and it wouldn’t have a future,” Contador told Marca on Tuesday. The two-time Tour de France winner is reportedly considering another appeal to the European Court of Human Rights. Contador was stripped of his 2010 Tour de France title and each of his victories from last season, including the Giro d’Italia. The former Saxo Bank-SunGard rider’s ban finishes on August 5, leaving the possibility of a return at the Vuelta a Espana. Meanwhile, Saxo Bank will retain their licence after the International Cycling Union’s request for it to be rescinded was turned down on Monday. Email “Contador decides against ban appeal following lawyers' advice”. Feedback on “Contador decides against ban appeal following lawyers' advice”.